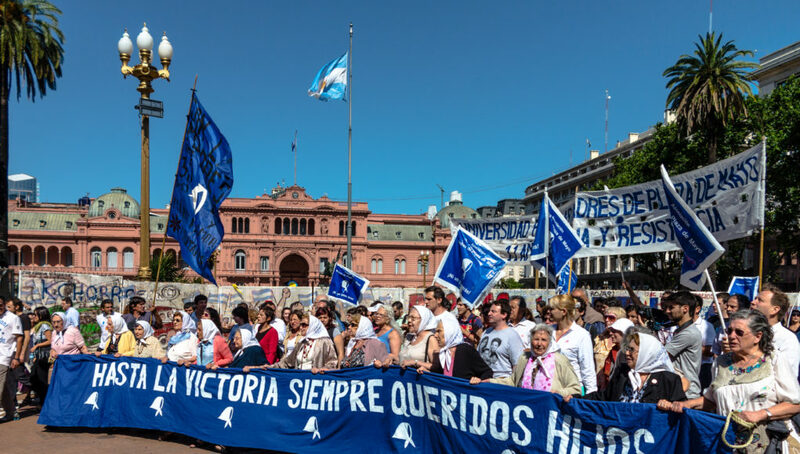 Every Thursday, as they have for more than 40 years, Las Madres de la Plaza de Mayo circle the Plaza de Mayo to demonstrate in support of their disappeared children and grandchildren. During the decade or so between 1976 and 1983, when a malevolent right-wing military dictatorship terrorized Argentina’s intellectuals, leftists, artists, and anyone else with the sense to see the damage being done, an estimated 30,000 people were kidnapped and never again heard from. One group of protesters, made up of mothers of many of the missing, did more to help overthrow that government than any other. During this dictatorship, opponents of the government would suddenly go missing and the police and military would deny any knowledge of their disposition. They simply disappeared. Of course, they were in the custody of the police and military, often being tortured and almost always winding up dead. The mechanical Las Madres sculpture at Ex-ESMA no longer operates, but it still stands as a testament to their courage and determination. The dictatorship even hid or disposed of the bodies in many devious ways, making recovery impossible. In some documented cases, live abductees were thrown from helicopters and airplanes flying over the Atlantic ocean. You can imagine the anguish and turmoil among the surviving family members, especially their parents. Not knowing whether their children were dead or alive would have made emotional closure impossible. What’s more, many of the abductees were pregnant women. The dictatorship kept them in seclusion through the terms of their pregnancies (even torturing them throughout their pregnancies) and then stole their babies to give to loyal followers of the dictatorship who were seeking to adopt children. The mothers were then killed and disposed of. This mechanical tribute to Las Madres is located at the site of the Ex-ESMA torture center. 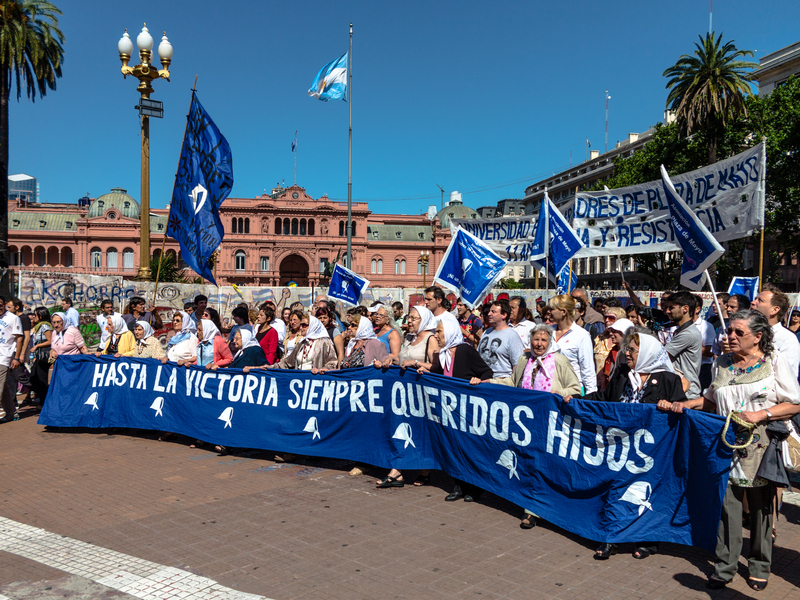 In 1977, a group of mothers whose children and grandchildren had disappeared began to demonstrate by marching around a monument in front of the Buenos Aires’ Casa Rosada, the building that serves as Argentina’s seat of government. Imagine the courage it would have taken to directly and publicly challenge the dictatorship’s actions, knowing that most people who did so were abducted by the dictatorship. Every Thursday, from then on; every week, every month, every year after, the mothers and grandmothers marched in their small circle around the monument in the plaza. Some were disappeared, but others continued. Fortunately for Argentina, the dictatorship fell out of disfavor by mishandling the Falklands Islands War with Britain. The ongoing pressure applied by Las Madres and others helped bring down the dictatorship. In the years since then, Las Madres have continued their struggle to uncover all the evidence they can find to help determine the fates of the thousands of people who disappeared and the locations of their stolen children. The original group and organization of Las Madres de Plaza de Mayo has undergone many transformations over the years, but they have survived in separate groups, including Las Abuelas de Plaza de Mayo, who focus on reuniting stolen children with their birth families. As of 2018, Las Abuelas have reunited 128 stolen children with their birth families. The iconic white scarf symbol of Las Madres is painted on the sidewalk in Plaza de Mayo, along with figures representing the number of disappeareds. Previous articleThese crude markers honor Argentinian heroes. Next articleCuba is in love with its cats.